Today is a normal day for me, and by that I mean I was looking up pictures and video of Kazuya Bai’s D1GP pro drift car, which is amazing. 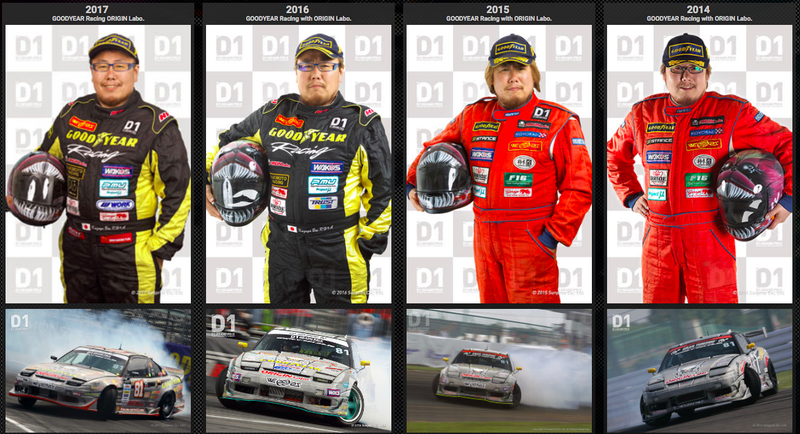 But then I stumbled upon Bai’s entry on the D1GP website and it showed not only Bai’s current photo for 2018, but also his photos over the past four years. This is genius. You can see how Bai cuts his longer blonde hair, a look that he’d been keeping since his early days of drifting. You can see how happy he still is, after all these years, still running a relatively simple, old Nissan 180SX. This is the car in which he performs some of the most exciting driving in drifting over the past few years, super snappy and aggressive, even busting his car to hell this past event. NASCAR needs this. Every racing series needs this. I want to see, side-by-side, pictures of Kyle Busch growing increasingly stubbly and severe. I want to see Jari-Matti Latvala grow wise and then agitated and then comfortable again as he switched teams, like Vettel from Toro Rosso to Red Bull to Ferrari. I want to see Hamilton’s hair grow as he gets older. Anyway, it’s a small thing, but it needs to happen.